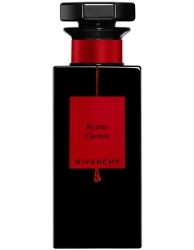 Givenchy has launched Myrrhe Carmin, a new addition to the luxury L'Atelier de Givenchy collection. Myrrhe Carmin follows 2018's Encens Divin. Dare to be dangerous with the Myrrhe Carmin eau de parfum, an exotic fragrance formed from a blend of spices. Deeply infused with sweet vanilla, the heady scent has notes of myrrh and cardamom. Presented to you in a rouge and noir bottle, it has a gothic allure. Additional notes include bergamot, ginger and rose. Givenchy Myrrhe Carmin is available at Harrods in the UK, in 100 ml Eau de Parfum, £170.